ESET Smart Security Premium is ESET's flagship product that has been built from the ground up to provide maximum functionality utilising advanced technologies in proactive detection to ensure comprehensive protection against viruses, trojans, worms, adware, spyware, phishing, rootkits and other internet threats allowing you to surf the internet, play games, movies and music, e-mail your friends and work in comfort with real peace of mind. 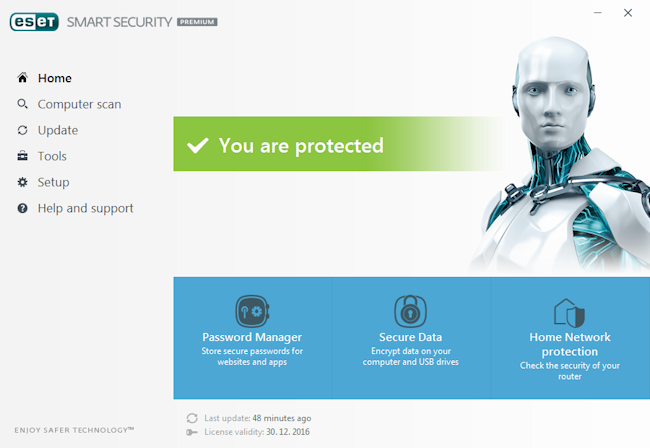 The new ESET Smart Security Premium allows you to safely store, generated and prefill your passwords as well as encrypting your files and removable USB media. Please note: the price quoted for this product is for college / university students only and we require a valid .ac.uk UK college / university email address for your license. Any orders for student licenses that are not submitted with a valid .ac.uk UK college / university email address will be cancelled and your money refunded.